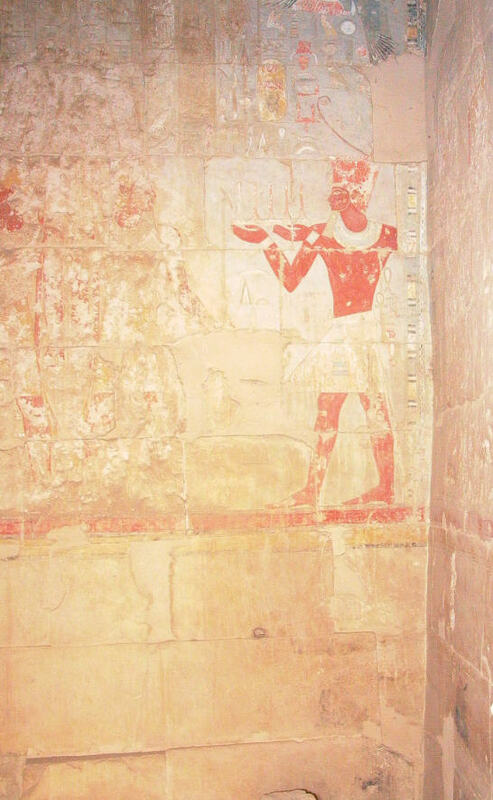 In the room at the south-western corner of the 3rd terrace - described by Naville as "Chapel of Amun" - well preserved multicolored pictures have preserved showing many cult objects used in the temple liturgy. Thus, it is likely that most of the things were used to worship Amun during his visit of the temple had been kept here. This is the only room in the temple in which an image of Hatshepsut has survived - only her names had been changed to that of Thutmosis II. 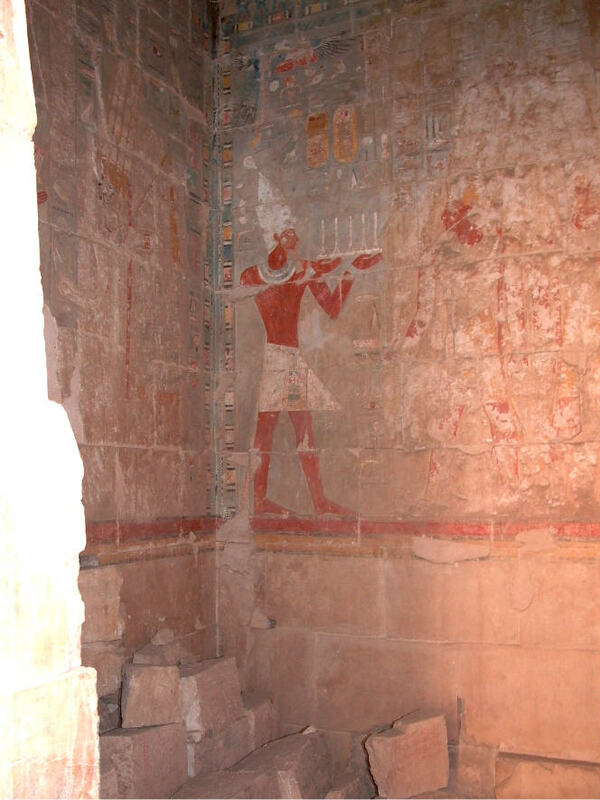 The three photos above show the walls of the southern Chapel of Amun seen from its entrance (I have pushed the camera through the gate; in each case the left side of the door-jamb is to be seen on the left side of the two left pictures). The two right photos show the wall opposite to the entrance, the left photo shows the left wall of the chapel (which is right next to the chapel of Thutmosis I). All scenes show a king offering to Amun: the middle photo shows Hatshepsut with the White Crown, the cartouche has been change to Thutmosis II (Aa-cheper-en-Ra), the right photo shows Thutmosis III with the Red Crown. The left photo shows a king wearing a composed crown frequently used by Thutmosis III, however, the cartouche is not readable. The presentations of Amun have been destroyed in the Amarna period. In "The Temple of Deir el-Bahari" Naville took the view that this room has been a chapel dedicated to Amun or a cleansing room, a Pr dwAt in which certain rites were done. He based this view on the fact that only Amun had been presented in the scenes. However, already Kees (in: Recueil de travaux 36, 1914; according to Awad) pointed out that this room had probably been used as a storeroom, because the wall inscriptions show that fabric and incense (or oil) which the king offered to Amun in all scenes of this room. In his thesis about the treasure houses of the New Kingdom Awad (2002) lists the room under "temple treasuries". The inscriptions on the architrave show offerings brought to Amun. The scenes are divided into two registers. In the upper register shows a variety of vessels which diefferent oils, e.g., "sTj-Hb = 'Fragrance of the Festival'-oil", or "tpt nt anty = myrrh of best quality ". The lower register shows chests which contained different fabric. The inscription before the 1st chest reads: "sSr tpy = high-rate linen", the 2nd chest contains "dmj" fabric, the 3rd chest: "sSr nsw = Royal linen", the 4th chest: "sSr tpj wAD = high-rate green linen" and the 5th chest according to the inscription: "jrtjw = red linen". = Already when you were still in your nest, I knew that you would build a monument for me. After I gave you all lowlands and all highlands the sun ball circles around and is in heaven [what] is in your charge, you filled my temple with all useful things of the Two Lands. Be happy, Kings of the Two Lands, given life forever like the sun-god" (translated from the German text published by Awad, 2002). The scenes on the western wall are very similar to the scenes explained above but for the most part destroyed. During restoration the stonemasons of Ramses III replaced the figure Hatshepsut by an altar, however, the inscription belonging to the offerings of the queen has been preserved. It tells that queen presents two kinds of oil to Amun: "STj-Hb = 'Fragrance of the Festival'-oil" and "Hknw"-oil. The scene on the southern wall opposite to the entrance may be taken as an evidence that this room was used as a storeroom for clothes. This scene shows Hatshepsut and Thutmosis III offering clothes and the "mnxt"-fabric to Amun. The accompanying text of the Amun which refers to Hatshepsut mentions that Amun has promised the queen "rnpwt r nHH m nsyt tAwj = everlasting years to kingship of Egypt". The words Amun speaks to Thutmosis III reads: "jw jb=j nDm wrt mAA=j nfrw=k = I am exceedingly pleased because I see your beauty".